A Vastness follows a scientist obsessed with a group of alien creatures. It is about searching for the meaning of your life and what you do when you finally realize what it is. The premise was interesting but I had trouble engaging with the story. I don’t know if it was because of the writing or the characters, but something was off for me. Also I found the ending was a bit anti-climatic. A pro-robot family living in a city where most people are afraid of them find themself in an accident involving one. Indeed, one day they found their house crushed by a giant mechanical arm. Not Now follows the repercussion of this accident on the family and particularly how their daughter is affected. It is about loss, discrimination and growing up. I liked the themes but the characters felt a bit too flat. The daughter was only anger and frustation and the parents were the definition of indifference. I understand how an accident could affect them but I don’t understand why they were made to be so one-dimensional. Set in alternative world where people are at war with either a) modified humans or b) humanoid aliens, Flying Oslige follows a woman who is just trying to survive the conflict. She is escaping her city with a small group of soldiers and we follow her journey as she tries to reach a safer place. But where can this be when you can trust no one? This story was terrific, I never wanted it to end and I hope Gwylan is going to expand this universe with a novel, a short story collection or both! I highly recommend this one. Farewell, Doraemon is about a man returning to his village after quiting his job as an illustrator in Beijing. However, it’s also about his childhood and his love for an anime, Doraemon, that changed his life when he was little. It’s also about friendship, love and the consequences of small actions. This story is quite melancholic and full of nostalgia but I was completely immersed in it. I found the whole thing fantastic: the characters, the ideas, the pacing, the ending, everything felt right. I believe I read something else by A Que in a previous issue of Clarkesworld and I remember really liking it as well so I should definitely check out other works by this author! Cold Comfort follows a very pragmatic scientist who is not afraid to commit a bioterrorist attack in order to show the world how dangerous global warming is. I really, really enjoyed two things in this story. First of all, I loved the main character and how sure she was of her action and I also loved how the authors imagined the future and how humanity will adapt. It still managed to feel optimistic (it reminded me a bit of New York 2140!) I won’t say much more but I want to read more stories set in this world! This is without a doubt my least favorte story of the issue. It follows a theft/murder investigation on a planet (Mars maybe? I don’t remember well which shows how much I cared!…). It felt very dated and I just couldn’t connect with anything. It wasn’t the worst story ever but I forgot it immediatly after turning the page and that’s definitely not a good thing. I wouldn’t recommend this to anyone. 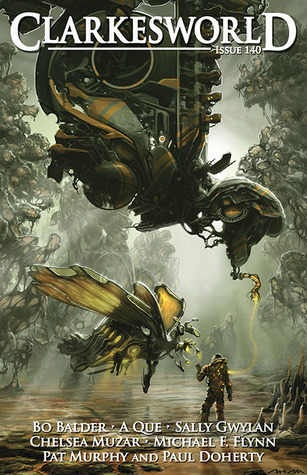 You can read all of those stories for free on the Clarkesworld website here. I know that not a lot of people read short stories but they are amazing! They really are a way to discover new authors and sample their style. The format is also great to tell certain stories that wouldn’t work on a longer format.